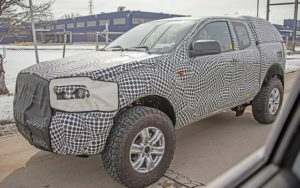 In case you desperately want to drive Ford’s old-school body-on-frame SUV, you don’t have to wait for the new-generation Bronco to arrive. No, because Jonathan Ward and his firm Icon made a cool vintage model that’s named Old School BR. As you can notice, the Old School BR looks exactly like the original model, but it’s not. The exterior design shows an authentic copy of the iconic off-roader, though everything else has been changed. The SUV rides on a custom Art Morrison chassis and which has been matched with an adjustable suspension with Fox Racing coilovers at each corner. The ride is additionally spiced with 33-inch BFGoodrich tires and custom axles. Up front, the wheels host four-wheel disc brakes with 6-piston calipers, while the rear axle brakes with 4-piston calipers. The Old School BR gets a Wilwood master cylinder and a Hydratech hydro-boost system too. The “heavy-artillery” braking system is necessary because the SUV uses a really powerful engine. Icon used the awesome 5.0-liter V-8 from Mustang GT. The mighty mill pumps out 426 horsepower, which is more than enough power for the Old School BR. Ward’s company offers two gearbox options to the potential buyers. They are able to choose between five-speed manual or four-speed automatic gearbox. This auto transmission is actually Ford 4R75W four-speed automatic with overdrive. No matter which option you choose, it’s going to send power to a four-wheel drive with an Advance Adapters Atlas II transfer case. The FWD gets six different low-range gearing options. As for the exterior differences, well, the Icon’s off-roader hosts LED lights and a totally new tire carrier. 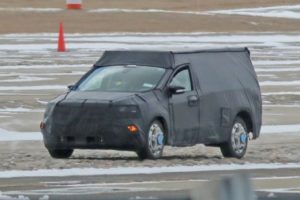 Inside, the SUV gets more drastic changes. There are a totally redesigned dashboard and aluminum-treated custom controls. Vents are also aluminum, while gauges may be new but still analog. The drivers will really enjoy inside thanks to Vintage Air climate control system and a Kenwood audio system. GPS navigation and Apple CarPlay compatibility are standard features, while customers can switch manual cranks for power windows. The Old School BR will be available in around six months. Icon hasn’t put a price tag on the amazing vehicle so far, but we don’t expect to be cheap.